Students are always watching, listening, and learning. 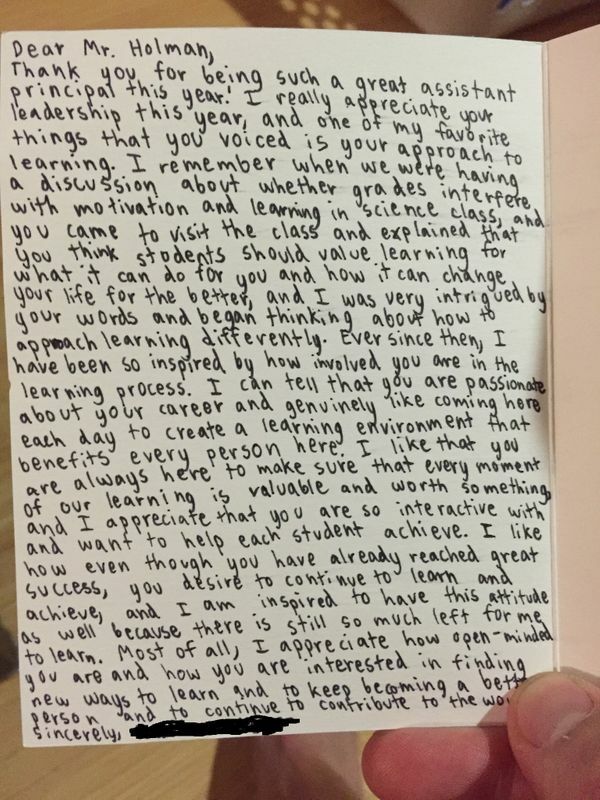 In this post I’ll attempt to analyze and learn from this amazing letter I received at the end of the year from one of my 8th grade students. Thank you for being such a great assistant principal this year! I really appreciate your leadership this year, and one of my favorite things that you voiced is your approach to learning. I remember when we were having a discussion about whether grades interfere with motivation and learning in science class, and you came to visit the class and explained that you think students should value learning for what it can do for you and how it can change your life for the better, and I was very intrigued by your words and began thinking about how to approach learning differently. Ever since then, I have been so inspired by how involved you are in the learning process. I can tell that you are passionate about your career and genuinely like coming here each day to create a learning environment that benefits every person here. I like that you are always here to make sure that every moment of our learning is valuable and worth something and I appreciate that you are so interactive and want to help each student achieve. This from a student who has never been in my office and who I never really had any conversations with beyond a quick hello in the cafeteria. Her mom did say to me earlier in the year that her daughter told her how nice it was “not to feel invisible” and that’s simply because I used lunch time to say hi to my students (not just yell at them from the stage). I like how even though you have already reached great success, you desire to continue to learn and achieve, and I am inspired to have this attitude as well because there is still so much left for me to learn. Most of all, I appreciate how open-minded you are and how you are interested in finding new ways to learn and to keep becoming a better person and to continue to contribute to the world. Ha! While our definitions of “great success” are (more than slightly) different, I appreciate the words! All of this started with participating in one science lesson at the beginning of the year. To my fellow admin, get your classroom observations in, not for observation sake, but for the sake of your school culture. You never know who is really listening and watching (and gasp, maybe even learning from you). To my 8th grade student: Thank you for taking the time to write such an insightful and thoughtful letter. I will read this when I need a pick-me-up during those challenging days. The kids want to learn. Let’s continue to challenge them with deep thinking activities before we jump into too much (science) content.